The best movie I have seen so far in 2005. How's that for an opening sentence to a review? Every review I've ever read talks about how Serenity is the follow-up to Joss Whedon's prematurely-cancelled TV show Firefly, so I won't. I'm going to attempt to review this movie based on its own merits. Which is going to be very hard, because I'm kind of a Browncoat. If you don't know what a Browncoat is in the context in which I mean it, then you aren't one. It's really hard to pinpoint exactly why Serenity is so good. It doesn't really cover any new ground so far as themes (good people on the edge of an oppressive society why try to make an honest living through crime) or character archetypes (the anti-hero Captain, bitter about his side loosing a civil war, who deep down has a heart of gold). The budget was lower than most slam-bang sci-fi flicks, and sometimes the seams show through in some special effects shots. There are too many characters for a 120-minute running time (seven main characters, four major supporting characters). The first five minutes or so cram in so much backstory that if you scratch your nose you'll miss something. And, let's face it, a sci-fi/western is nothing new. And yet the film not only works, it soars. Why? Sure, there are exciting action sequences, surprising plot twists and turns (including one exceptionally shocking moment that made the entire packed theater jump out of their seats and gasp), and a smart, self-confessed "monster" of a villain. I think the reason Serenity is so wonderful to watch is summed up at the beginning of the film by the villain. Watching security footage of Simon Tam (Sean Maher) breaking his sister River (Summer Glau—brilliant in the role) out of a government mind-washing institute and thereby throwing away his inherited fortune and a promising career as a brilliant surgeon, the government's unnamed Operative (Chiwetel Ejiofor) remarks that Simon isn't insane for throwing everything away like this. He points out the expression on Simon's face and says that it was love that made him do it. And love is far more dangerous than insanity. And love is the key to Serenity. And I don't mean in a romantic-type of way (although there is a little bit of that between Simon and engineer Kaylee, and also between Captain Mal and the mysterious Inara, an old flame). When the movie starts the crew of Mal's spaceship Serenity have fallen on hard times. Important parts are falling off the ship, and they're resorting to stealing payrolls in order to keep her flying. Tensions are high when Mal brings River along on the mission because of her psychic abilities (during the mission she points out a man who is secretly armed) but despite her government-induced psychoses. Tensions are high anyway because harboring the sibling fugitives have meant constant running for the Serenity for the last eight months. Mal and second-in-command Zoe disagree about priorities. Zoe's husband (and Serenity's pilot) Wash and ship's muscle Jayne disagree about appropriate levels of violence. Kaylee has a frustrating unrequited crush on Simon, who is too busy trying to take care of his mentally unbalanced sister to reciprocate the feelings. Mal's bitterness apparently earlier "drove Inara away," and now Simon & River are on the brink of leaving the ship as well. In other words, everyone is squabbling and no one is particularly happy with anyone else. And yet when crisis strikes and the plot of the movie really begins, the crew begins to pull together. As the Operative closes in and begins targeting those around them, and River's psychic tendencies lead them in a frightening new direction, the crew supports each other more and more. At the beginning of the final act Mal sets them all on a course that will almost certainly lead to their deaths and gives a "I've never asked more of you than I do now" speech, giving them the option to back out now before it's too late. None of them do. 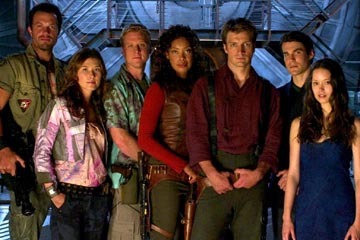 The crew of Serenity, as different as they all are, are a family. Mal, stoic though his exterior may be at times, loves each and every one of them, and they all in their own ways love him and each other. Even tough guy Jayne, who was the most vocal about getting rid of fugitives Simon and River, comes around. This movie is about a loose group of people on hard times that comes together as a loving family in the face of a crisis bigger than any of them. They all make hard decisions. They're all willing to sacrifice anything-and-everything for each other, just like Simon was willing to do when he broke River out of the government facility. They do some crazy things, but as the Operative said, it isn't insanity that makes them dangerous. In the end, this is a family that has been through Hell and come out battered, forever changed, but stronger than ever. And we've shared every agonizing (and often hilarious) moment with them. We feel as much a part of this family as any of the characters in the movie do. The characters and their interactions, far more than any of the pretty special effects, are truly beautiful sights to behold that screen. I can't recommend this movie more.